In bowl, mix water, oil, yeast and sugar. Let rest for 15 minutes. This is called “proofing” the yeast. Mix in salt, egg and flour. Knead until soft and smooth. Form into 12 balls and place onto 9×13 greased baking dish. Allow to rise for 10 minutes. Let rest for 15 minutes. This is called "proofing" the yeast. Form into 12 balls and place onto 9x13 greased baking dish. I've never made rolls before, but these look like a great set to make and try out. Thanks for posting these! If you ever are looking for another linky, I run Tuesday Greens on www.craftygardenmama.com. I'd love to have you swing by. Have a great week! Whenever I use yeast to make anything, it always fails me. Going to try these and hope it works! Be sure you liquid is not too warm. I have used this recipe several times and it always works perfectly! Thank you for it. I am going to use it again today using whole wheat flour only. I'm so glad you like it! I just made a batch yesterday. They are so yummy! Well, I would say you did excellent, especially for your first try. Congratulations! They look good. I made these this week and the family loved them! Easy and fast (yay for me!) and went well with beef stew. Featuring this post at the Mom 2 Mom Link-Up this coming Monday. Thanks! I'm so glad you liked them! My husband eats like 6 when I make them lol. Thanks for featuring me!! I just want to know if they are salty. Just seems like a lot of salt and I love salt. Thanks. No, they don't taste salty. I'm a sucker for a good yeast roll. Thanks for linking up at Show Me Saturday. Hope to see you there again this week! I have been having an itch to make lots of foods from scratch now a days and bread products are something I'm trying first. 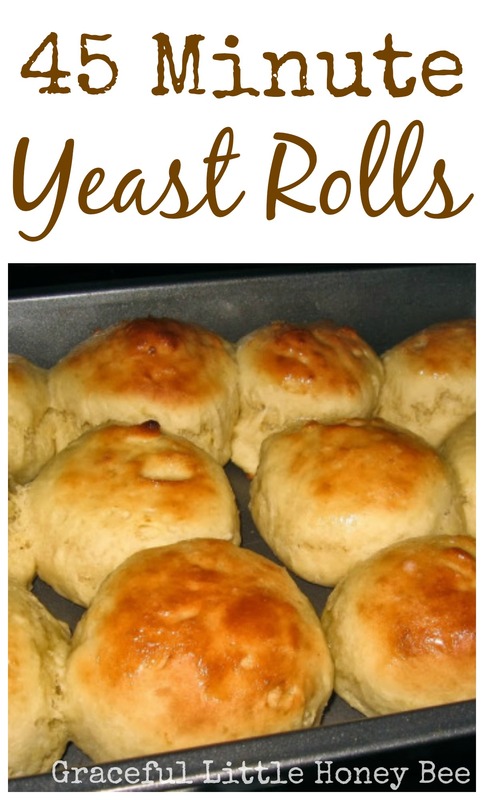 In this roll recipe is there a way to add butter or even sugar to make them similar to Logans Roadhouse restaurant or even Golden Corral's? We are trying the "Simpler Times" frame of mind since finances and healthier choices need to be made. Next venture is gardening although I've tried growing "easy tomatoes" and failed. :( I'm going to try again. Thanks for all your tips, tricks and recipes. You could probably get away with adding some sugar, but I'm not sure about the butter. You could always brush melted butter over the tops after they come out of the oven. Good luck with your gardening ventures! Just keep trying and you are sure to get it right! Just made these and they are delicious! I ate 3! I just made these and this is the first time that I have ever made bread and it turned out awesome. The only thing is that they didn't turn out as brown as yours. Did you out butter on the top before you baked it? I think I spread melted butter over them after they came out of the oven. Try cooking them a little longer for a browner top.